Maggi, the iconic brand, which, in the consumer’s perception, owns the bouillon cube category wanted to introduce a variety of new products to the Nordic markets. The task was to expand the brand in order to embrace new product categories, such as ‘almost ready meals’ and spice-mixes, which add value to the meal. We have created packaging design for several different product ranges - such as Juicy Chicken, Pastaria, Fond Cups and Mixes. 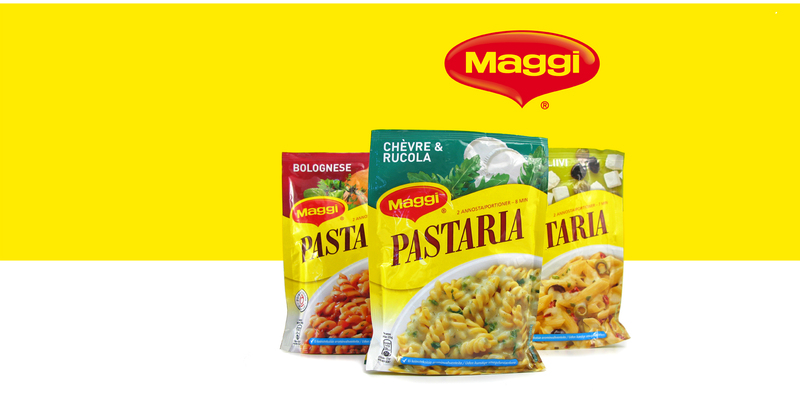 It has been an exciting challenge to expand the Maggi brand to include other products beside the cube, without making the brand lose credibility. We have created an endorsed brand structure; the iconic brand is maintained, while sub-brand universes, which focus on food appeal and fresh ingredients, have been created. Fresh, clear colours secure a strong differentiation within the product ranges and ensure that the products stand out in the shelf.